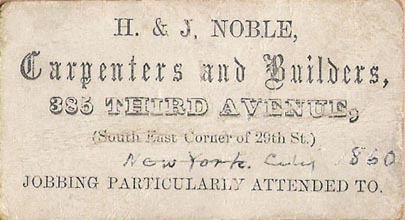 H. and J. Noble, Carpenters and Builders, 385 Third Avenue (South East Corner of 29th St.), New York City. Notes from Contributor: Business card for Hiram & John Noble circa 1860. Hiram was born 25 February 1833 in New York, New York, and died 6 October 1913 in Fulton, Whiteside, Illinois. John was born 13 September 1835 in New York, and died in 1918. Their parents were Edward and Mary (Johnson) Noble. Are you looking for NOBLE ancestors? If so, we suggest posting a query to our Community Message Board to get assistance from other researchers.